Trainer-assisted stretching just isn’t taught in the traditional personal training curriculum. There is the expectation for you to know everything about working your clients out, but when it comes to recovery & mobility, there is very little knowledge in comparison. Why is it so important to stretch your clients? Results. Your clients come to you to get results. They depend on you to have the knowledge and skill set to get their body to do things that it’s never been able to do before. In order to get the BEST possible results for them, stretching must become a part of their training. And I’m not talking about just doing the 30-second hamstring stretch. It goes beyond that. You need to know how to deal with a client who comes in complaining about lower back pain, knee pain or shoulder pain. All of these “conditions” can usually be dealt with through several targeted stretches. When you learn how to properly stretch your client they will not only feel better but also perform better inside and outside of the gym. Clients LOVE to get stretched It’s a simple fact that clients love when their trainer can stretch them. It feels great and usually, they don’t have the desire or time to do it themselves. Immediately, your popularity ratings will go up with your clients. You will be THE person that they go to when they have specific aches & pains because they know that you have the right stretches for them. This brings your value as a trainer WAY up. I once had a client who had just come back from a long trip. He showed up for his training session with a severe case of sciatica going down his left leg from sitting too much during his travels. He was in a significant amount of pain. He limped over to me and said he was ready to train, however, he wasn’t feeling the best. I immediately assessed the situation and had him lay on a yoga mat for a few minutes, I took him through a series of stretches to open up the piriformis muscle and he was no longer limping when he got up. The pain had significantly diminished. I then gave him some “homework” stretches to help open up his tight glutes. I saw him a week later and he was good as new. He had been doing his homework and kept expressing to me how thankful he was to me for knowing what to do when he was experiencing the sciatica pain. From that day, he has been a lifelong client. What if I told you that you can actually earn more money just by stretching your clients before or after their workout. Acquiring these skills puts you above the curve of all the other personal trainers out there. Remember, I said roughly only 20% know how to stretch their clients out properly. Therefore you will be able to charge more for your services. Which is a win for you and a win for the client, who can now get stretched regularly. So, how can you learn these stretching techniques? 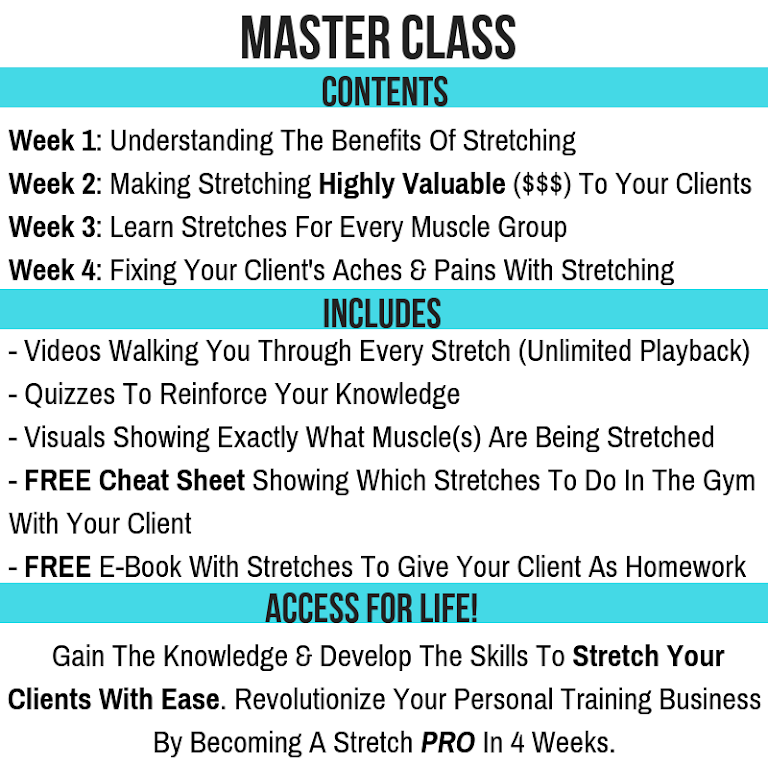 Enrol in the Advanced Stretching Techniques master class that teaches personal trainers everything they need to know about stretching their clients by clicking here.